Do you know on 2 January 2002, Crompton Greaves had a market cap of Rs 115 crore and its stock was at Rs 1.80. Today, on 05th Nov'15 the stock price is closed at Rs 168.80 and the company's market cap is Rs 10,610 crore. Rs 1 lakh invested Crompton Greaves in Jan 2002 is almost Rs. 94 lakhs today. Lets take another example of little known company Camlin Fine Sciences which is our 19-Bagger stock. We recommended this stock 4 years back at price of Rs. 6.05 (adjusted price after 2 stock splits in last 4 years, actual recommended price was Rs. 60.50) and today it’s closed at Rs. 113.60 giving absolute returns of 1778%. That's too excluding dividend payouts. Mind boggling, isn't it? It's a fact! Company has posted strong growth YoY and rewarded share holders in big way in last 4 years. It’s a fact that 28 Hidden Gems out of 41 released by our equity analysts in last 5 years (till Dec'14) have given more than 100% returns. Saral Gyan team do take care of above concerns by doing in-depth research and analysis of small cap companies before releasing Hidden Gems research reports with buy recommendation. Its sincere efforts, dedication and passion of our equity analysts that 28 out of 41 Hidden Gems released by us during last 5 years have given more than 100% returns to our members. In fact 20 out of these 28 stocks are giving returns in the range of 200% to 1900%. Now that's the past, let us see how our Hidden Gems of 2015 have performed so far this year considering recent market correction of more than 10% in broader indices from all time highs made in Mar 2015. We are pleased to share with our readers that Hidden Gems stocks - 2015 average returns as on date is 35.8% compared to negative return of small cap index returns of -1.1%, hence outperforming small cap index by 36.9%. 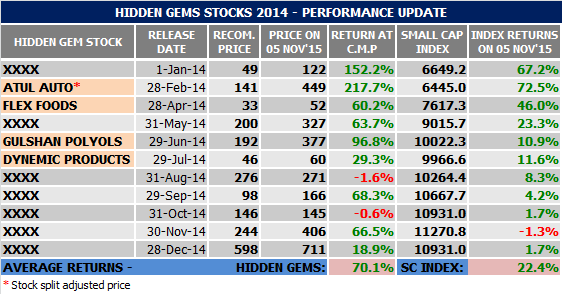 Let us review Hidden Gems stocks performance of last year, Hidden Gems stocks of 2014 also outperformed small cap index by wide percentage points giving as on date average returns of 70.1% compared to 22.4% returns of small cap index. We are pleased to inform that we are celebrating this festive season by offering maximum benefit to our members. On this auspicious day, you can avail attractive discounts and freebies on our subscription services under our Dussehra - Diwali Offer of the Year. Subscribe to our services and get rewarded by making educated investment decision in equities. You can subscribe online to our services by simply click on SUBSCRIBE! link. In case if you are not comfortable in subscribing online, click here to check our other payment options and bank details.